Sober Look: Iran's game of chicken has turned into the "chicken crisis"
Iran's game of chicken has turned into the "chicken crisis"
Per yesterday's discussion on rising food prices, it will be the people of the weaker third world economies who will suffer the most from the North American drought. The probability of domestic unrest in many nations is on the rise, though not all will pose risks to global stability. Iran however is one of those countries. Because of its military capabilities and its location in the region, a destabilized Iran could be more dangerous to world economies than the problems faced by the Eurozone or China. Iran, which is normally viewed as one of the wealthier third world nations because of its natural resources and a relatively large middle class (about a third of the population is now considered "middle class"), has completely mismanaged its domestic agriculture. Typically that wouldn't be a problem because exports of oil and petrochemicals would pay for food imports. But recently Iran has managed to become so isolated from the rest of the world, that it doesn't even have access to the international payment systems such as SWIFT. To get around sanctions, Iran has been arranging barter transactions that do not involve cash movements, for example exchanging fertilizer for grain with Pakistan and India. And even these deals have so far been fairly unsuccessful. Nations who are able to sell grain to Iran will either want to sell their low quality product or receive a premium for quality crops. Otherwise they can simply sell the commodity in the open market and not worry about the international sanctions impacting their relations with the West. The food problems in Iran have gotten worse even before the spike in agricultural commodity prices. Just to put things in perspective, escalating cost of chicken for example is now becoming a major problem. Prices of chicken have more than tripled in a year. Reuters: - The soaring price for a staple food that Iranians relish cooked with saffron, plums or pomegranates has become such a hot topic of public debate, and a sign of the sinking purchasing power of many Iranians, that Police Chief Esmail Ahmadi Moghaddam felt it his duty to intervene. He urged television stations to avoid broadcasting images of people eating chicken, saying such pictures could fire up social tensions, with perhaps unforeseen consequences. "Certain people witnessing this class gap between the rich and the poor might grab a knife and think they will get their share from the wealthy," Mehr news agency quoted him as saying. Mehr of course promptly took that article down. But among ordinary Iranians the inability to purchase chicken has become a major topic of discussion that is turning into a simmering political issue. Covering up images of people eating chicken is not going to make the problem go away. 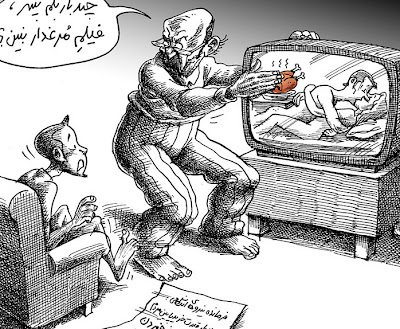 Reuters: - Iranian cartoonist Mana Neyestani, who lives in France, mocked Ahmadi Moghaddam's warning with a cartoon of a young man watching a pornographic film. His father tries to cover up only the image of a roast chicken in the background of the film, saying: "How many times have I told you not to watch films with chicken in them?" Once in a while the government sells subsidized (discounted) chicken, creating long lines that represent the humiliation of the Iranian people. The Guardian: - This year, however, the [Ramadan] festivity is marred by unprecedented inflation caused by a combination of governmental economic mismanagement and western sanctions. Prices of fruit and sugar, among other staples, have soared – in some cases showing threefold and fourfold increases. The price of meat has gone up to such an extent that many now eat it only on special occasions. The latest controversy has been branded by Iranian media as the "chicken crisis". In an attempt to bring the ever-increasing price of chicken under control, the government has filled the market with subsidised chickens, prompting long queues in places where they are sold. Some require customers to show identity cards in order to stop them buying multiple times. And now if we overlay the rapidly rising global food prices on top of an already acute situation, many in Iran could be facing starvation in the near future. The drought shock that started is North America is about to make its way into the Middle East claiming Iranian people as its victim. In this global market it doesn't matter who will or will not be selling food to Iran. The fact remains that prices will spike way beyond current levels and there will be limited currency from oil sales to cover these rising costs. This is inexcusable for a nation with such tremendous natural resources. But the authorities in Tehran don't seem to be interested in addressing this danger in any serious way. Instead they are committed to ever more belligerent and irresponsible policies - blaming others for the troubles that the Iranian people are facing. And the scarce resources now available to the government are being diverted for other purposes. FARS News: - A senior commander of the Islamic Revolution Guards Corps announced that the IRGC Navy plans to stage massive naval wargames in the near future in a bid to maintain its capability of defending the country's territorial waters. Speaking on Tuesday Lieutenant Commander of IRGC Navy Rear Admiral Javad Moshidi said the IRGC naval forces will stage wargames in the near future, and added that the necessary equipment has already been supplied for the drills. The IRGC Navy is fully prepared to carry out the exercises and will once again display its military might to protect Iran's borders, the commander stated.